Please read testimonials from our patients, below. If you wish to share your own experience with Implant Dentistry of Greater Lansing, visit our Write a Review page. You may also read or leave a patient review for our practice on our Google business listing. For more information, please call our office: Lansing Office Phone Number 517-484-0329 . I have never really like my smile, didn’t like having my photo taken. Dr Crawford and his staff made my transition awesome, pretty much painless and now I smile all the time. THANKS guys!! I love watching people look at me trying to figure out what’s different. Dr Crawford is VERY TALENTED!! Entire office staff made me feel at ease and very comfortable. I recommended Implant Dentistry to three other people within an hour after my appointment. Thank you for all the “new” and fun experiences!!!! I’m looking forward to a bigger and brighter smile! My husband and I lived and worked in the Lansing area for many years and during those years we went to Dr. Crawford’s office for our dental needs. We moved up north approximately 100 miles one-way in 1999 and we just can’t see ourselves giving up the best of the best. So, we travel the miles for our dental work. Dr. Crawford and his Staff are “just what our teeth need”!! Thank you Dr. Crawford and Staff for taking such good care of us for over 25+ years and making us part of your little family. Dr. Crawford and his entire team provide absolute excellence at every level. I had a thorough, gentle cleaning and an exam that was extraordinary. Dr. Crawford even offered to improve my smile which thrilled me. He stayed late after a very busy day to accommodate me!! All this, a beautiful smile and delicious coffee too! I highly recommend Implant Dentistry of Greater Lansing and Dr. Crawford! Dr. Crawford is the best dentist ever! And he has the best team working for him. I went into the office yesterday with pain in my jaw and tooth. Unfortunately, I had a cracked, infected, abscessed tooth that needed extraction. The pain management was awesome and I didn’t feel a thing during the procedure. In fact, my tooth was out and I didn’t even realize it because it happened so fast. 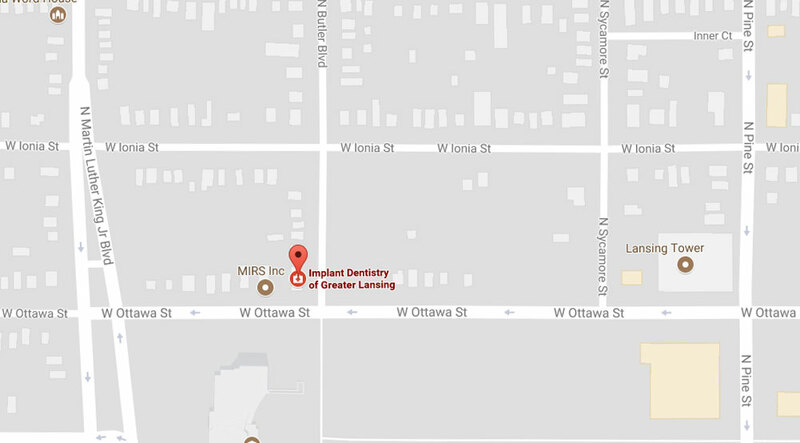 If you’re in need of a dentist with a great team, please consider Implant Dentistry of Greater Lansing!